UC Riverside student volunteers, recruited by Global Food Intiative Fellow Claudia Villegas, set up new garden beds at the Community Settlement Association. For low-income Californians who can't afford to purchase fresh and healthy fruits and vegetables, the suggestion to simply grow their own is well-intentioned, but overly simplistic advice. UC Cooperative Extension in Riverside County is bringing together students, agencies, nutrition educators and gardening experts to work alongside families to grow produce in garden plots at a community facility. This year, the local coalition received $10,000 in support from the Kaiser Permanente Heal Zone project to expand a vegetable garden at the Community Settlement Association (CSA), a center where community members gather for UC CalFresh nutrition classes, weekly food distributions and other services. In 2014, UC Master Gardener volunteers, nutrition educators and members of the community planted vegetables in five existing garden boxes at Community Settlement Association, 4366 Bermuda Ave. in Riverside. For planting day, neighborhood families – many who had taken part in UC CalFresh nutrition classes at the CSA – tilled the ground and planted seeds and transplants to grow tomatoes, bell peppers, summer squash, lettuce, green beans and Swiss chard. In 2015, UC CalFresh arranged a $500 grant from Wood Streets Green Team, a local group that promotes sustainable living, to purchase fruit trees. Master Gardeners led volunteers to plant blackberry bushes, and peach, pluot, nectarine, plum, fuji apple and mini mandarin trees. They also planted quince, pomegranate, lemon and lime trees donated by a Master Gardener. With the Heal Zone funds and support from UC Riverside student Claudia Villegas, the recipient of a Global Food Initiative Fellowship from the UC Office of the President, an extended garden began to take shape. 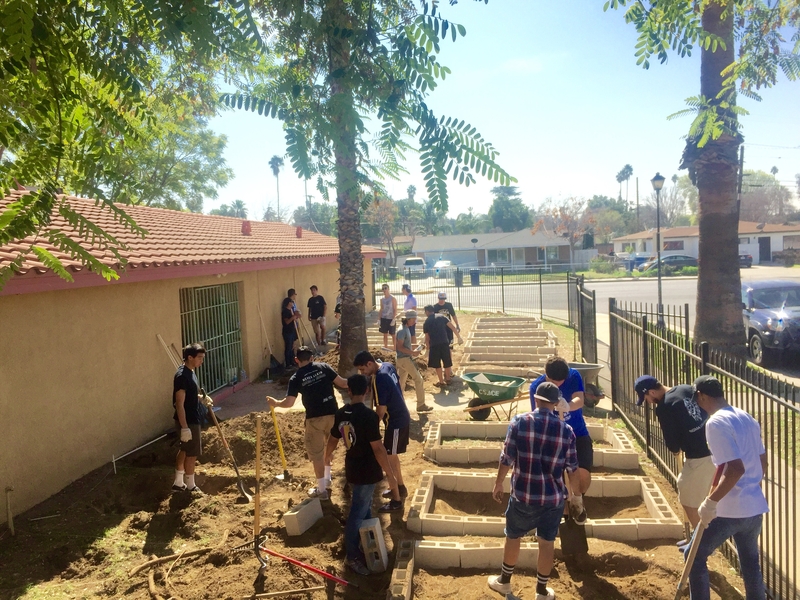 Villegas recruited students from Sigma Alpha Epsilon and Phi Chi Theta fraternities to transform a lawn at the community center with cinderblock raised beds. She is coordinating training sessions and encouraging local families to visit. The raised-bed plots have been assigned to families in the community. A gardening club now meets from 9 to 10 a.m. the first Thursday of each month at the community garden. UC Cooperative Extension coordinates gardening workshops with UC Master Gardener volunteers and nutrition and cooking sessions with UC CalFresh educators. A 4-H club for children in the community is also being developed at the CSA site by Claudia Diaz Carrasco, UCCE 4-H Youth Development advisor. The purpose of 4-H clubs is to help diverse young people discover and develop their potential and grow into competent, contributing, and caring citizens. “We believe that CSA children will benefit a lot by participating in 4-H learn-by-doing activities within the club,” Diaz said. 4-H clubs usually meet in the evenings or on weekends and offer self-chosen multiple learning experiences.